Billie Eilish posed for the January 2019 Issue of InStyle Australia wearing a Marques’ Almeida Silk-Scarf Blouse ($236.82), I.AM.GIA Gwen Pants (Sold Out), Eddie Borgo Hoop and Sphere Drop Earrings ($275.00) and Sandro Sneakers with Flames on the Sole ($255.00). In another shot she wore a Knit Cropped Sweater ($466.22) and a Pleated Checked Jacquard Midi Skirt ($1,044.00) both by Fendi, a Lucy Folk Green Hues Ring ($825.00) and Witchery Tegan Leather Slides ($19.95). 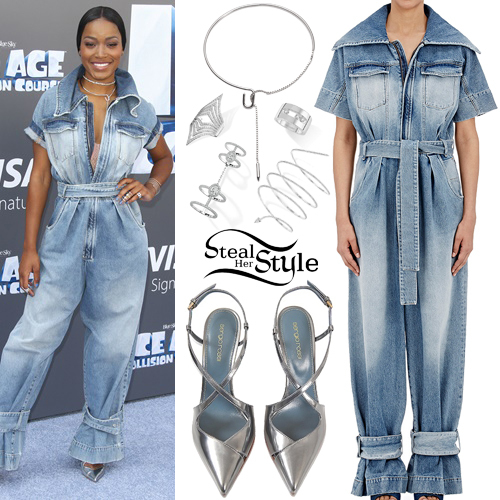 Keke Palmer arrived at the premiere of ‘Ice Age: Collision Course’ yesterday wearing an Off White Denim Jumpsuit ($448.00) with Sergio Rossi Bon Ton Shoes ($290.00). 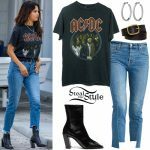 She accesorized with two Amazone Double XL Ring, a Queen V Double Pavée Ring, a Move Joaillerie M Ring, and the Snake Skinny 5 Rangs Bracelet all by Messika (Not available online) and an Eddie Borgo Allure Collar ($275.00). You can find similar shoes at ASOS ($57.00). Fifth Harmony posed for Fashion Magazine’s Summer 2016 Issue. Lauren Jauregui was wearing a Sandro Sacha Lace-Up Sweater ($186.00), a BCBGMAXAZRIA Ingrid A-line Skirt ($158.00), an Eddie Borgo Pavé Safety Chain Choker ($750.00) and Topshop Sienna Platform Sandals ($80.00). Vanessa Hudgens attended the Coachella Valley Music & Arts Festival yesterday wearing a Camilla Coats of Light Halter Neck Layered Dress ($649.00), an Eddie Borgo Safety Chain Choker ($375.00), Jimmy Choo Andie Round Sunglasses ($373.00) and Stella McCartney Lucy Flat Sandals ($400.00). Victoria Justice posed at the Nylon Young Hollywood Party last night wearing a BCBGeneration Flowy Hem Dress ($74.00), an H&M Black Leather Belt ($12.57), the Kate Spade Ivy Place Alexis Clutch ($198.00), an Eddie Borgo Three Finger Ring ($125.00) and a pair of BCBGeneration Mystic Platform Sandals ($129.00). Taylor Swift posed for the December/January issue of Lucky Magazine. In this shot Taylor is wearing a Sandro Sparks Plaid Print Mohair Sweater ($375.00), the Topshop Armour Sequin Pelmet Skirt ($170.00) and a pair of Tabitha Simmons Bryon Boots ($765.00). In another shot, Taylor wore a Victoria Beckham Flock Dot Collared Shift Dress ($1,018) with the Imitation Turquoise Pyramid Ring ($100.00) and the Stackable Gemstone Cone Ring ($150.00 – set of 4) both by Eddie Borgo, and an Inez and Vinoodh 18-Karat Gold Emerald Interlinked Ring ($930.00). 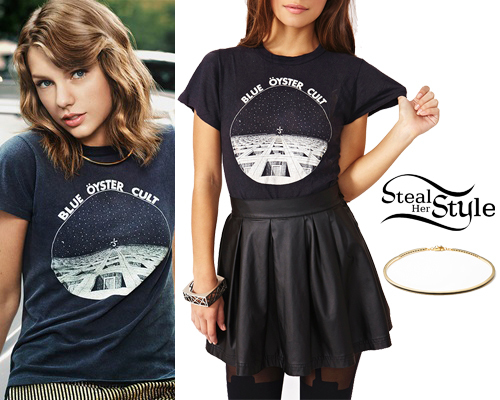 In this shot she is seen wearing a Nasty Gal Blue Oyster Cult Tee (Sold Out) and an Eddie Borgo Color Collar ($190.00). 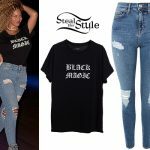 Rihanna was spotted leaving her apartment wearing a pair of Citizens of Humanity Premium Vintage Racer Skinny Jeans ($248.00), a top similar to this one from 525 America ($37.99), a pair of Manolo Blahnik BB Suede Pumps (sold out), a Louis Vuitton Alma BB Bag ($1,200.00), a pair of Prada PR09PV Glasses ($161.24) and a Eddie Borgo Large Supra Link Chocker ($650.00). 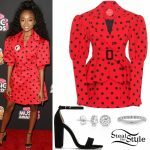 You can get a similar necklace from ShopBop ($60.00), a bag from Wholesale2 ($29.99) and shoes from DJPremium ($47.00).